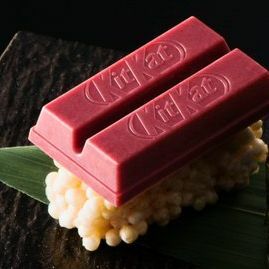 Kit Kat Japan has a tradition of releasing bars in an array of flavors so huge, it’s been forced to move into alcoholic beverages and condiments, but the brand’s mad flavorists are finally correcting a glaring omission: “sushi” Kit Kats. The specialty bars were created to celebrate the first “street-facing” Kit Kat shop, which opens February 2 in Tokyo (yes, Japan already has dedicated Kit Kat retail outlets, but this one’s the big time because it isn’t inside a mall or department store). There are three flavors. “Tuna,” naturally, which is entirely free of raw fish, thank God, relying instead on raspberry for its dark-pink color. The vinegared rice has been swapped out, so the bar sits on a sweet, puffed version coated in white chocolate. The second is tamago, that omelet-y egg dish. Pumpkin pudding gives the bar an uncomfortably familiar pale-yellow look, and it comes on a bed of puffed rice as well, wrapped in actual seaweed this time. The third bar is meant to emulate uni, and appears to get pretty close by mixing Hokkaido melon with creamy mascarpone cheese. It’s served in the classic gunkan-maki preparation style, meaning this one has a full band of seaweed.